So honored to recieve the following story from a dear woman in Australia about the loss of their “fur kids.” When you read this, she paints a word picture so you can see and recognize the connection of Animals and Humans. I would like to give you a brief story, it explains how we handle the loss of our furkids. A couple of years ago we lost one of two brothers that we have owned all their lives. They took our hearts from the moment we met them. Two beautiful Border Collies. We took them everywhere with us, we travelled in a Ford ute with a custom made mesh canopy on the back just for Mattie and Dylan. They travelled much of Australia and lived in two states and the Northern territory. During these years we almost lost Dylan the red and white Border collie many times. Once, he got a fright from fireworks and took off before we could contain them in the ute. It was three of the hardest days, door knocking, printing signs, driving everywhere. With the support of friends from the area ( we were visiting) we found him and once again the two brothers were reunited. Another time, hubby was driving the toyota wagon and Dylan leant out the window too far and he fell ontp the highway at great speed and took off into the bush. Hubby found him and took him to the vet, hardly a scratch thank heavens. Because he was a rare ( at the time) colour, a fellow tried to steal him but he was stopped and Dylan was safe.Another time we had to put them in the kennels for two weeks, they were together and yet Dylan fretted and got sick and the kennel ( thankfully we never returned) didn’t notice he lost 11 kg!!!! Dylan recovered from this with love and the help of a great vet. One day when he was about 5 year old, he had a limp so off to the vet we went. He had bone cancer:( we thought we would lose him but thankfully we had everything on our side and he came home and quickly recovered. One day we headed out in the car without the dogs, they were 14 yr old. Dylan was sulking and in hindsight we should have realised he wasn’t well as he rarely sulked, but we thought he wanted to come for the drive as they often did. So we told him not to be naughty and we would be back soon and drove off for the day. On our return we realised he was ill, it breaks our heart even now, the shame of not realising he was ill.
We rushed him to emergency and they said he had tumours that had burst. We had to put him down. Its been a few years and it still hurts. We were holding him and cuddling him before the vets put him down, he was happy right up until the end. The ONLY way we deal with the pain is knowing that we could have lost him on numerous occasions, many many times we almost lost him. We are so grateful that we had almost 15 amazing years with this faithful, beautiful boy and his equally beautiful brother who stayed with us another 2 years. We lose a part of our heart each time we lose one of our Furkids. We don’t regret one moment spent with them. I hope in some way this story will help another person cope with their loss. 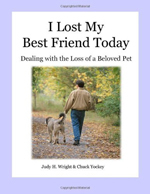 PS: Please share your story of a beloved friend and fur kid with judy@deathofmypet.com Be sure to put PET STORY in the subject line, so it does not fall through the cracks. PSS. If you are having trouble dealing with the loss of your pet, please contact us to see if you would benefit from some private coaching or making a tribute book on your beloved pet. You will be glad you do.